The long life of lithium ion batteries makes them the rechargeable of choice for everything from implantable medical devices to wearable consumer electronics. But lithium ion batteries rely on liquid chemistries involving lithium salts dissolved in organic solvents, creating flame risks that would be avoided if the cells were completely solid-state. Now a team of researchers at Tohoku University in Japan has created a new type of lithium ion conductor for future batteries that could be the basis for a whole new generation of solid-state batteries. It uses rock salt Lithium Borohydride (LiBH4), a well-known agent in organic chemistry laboratories that has been considered for batteries before, but up to now has only worked at high temperatures or pressures. In the journal APL Materials, from AIP Publishing, the researchers describe how they doped a cubic lattice of KI molecules with the LiBH4. This allowed them to stabilize the high-pressure form of Lithium borohydride and make a solid solution at normal atmospheric pressure that was stable at room temperature. "In other words, LiBH4 is a sort of 'parasite' but not a host material," said Hitoshi Takamura who led the research at Tohoku University. 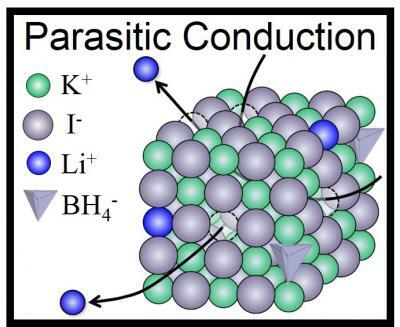 He and his colleagues have called this mechanism "parasitic conduction" and have suggested that it could be broadly applied in the search for new batteries -- anywhere that small amounts of Li+ ions could be used to dope an oxide, sulfide, halide or nitride host material. "This work suggests the potential of this mechanism in the ongoing search for the perfect material for use in solid state batteries," added Takamura. "The urgency of this quest has been abundantly clear after the grounding of so many aircraft in recent months."